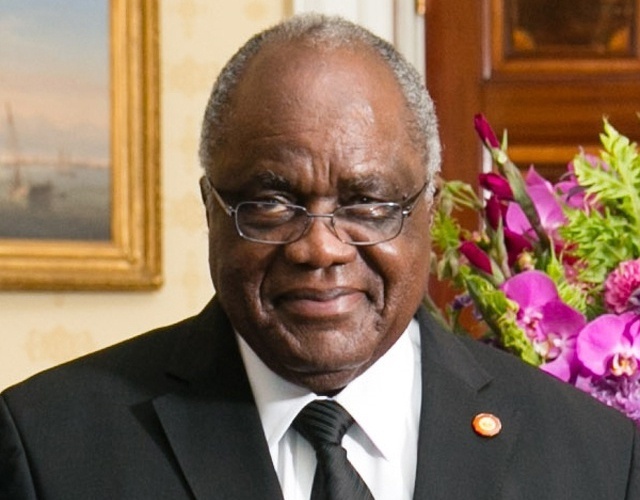 (Seychelles News Agency) - In two week’s time 79-year old President Hifikepunye Pohamba of Namibia will be retiring and handing over power to the newly elected President Hage Geingob. Pohamba has completed his constitutional two-term limit and as he saunters into retirement the Namibian leader got a delightful retirement package when he was named on March 2, as the winning recipient of the 2014 Ibrahim Prize for Achievement in African Leadership. The citation not only applauds Pohamba’s time in office but is a major image booster to Namibia. “During the decade of Hifikepunye Pohamba’s presidency Namibia’s reputation has been cemented as a well-governed, stable and inclusive democracy with strong media freedom and respect for human rights,” said long-serving Tanzanian diplomat Salim Ahmed Salim, reading the citation at a ceremony held in the Kenyan capital, Nairobi. Salim who is the former Secretary General of the Organisation of African Unity (OAU) is the Chairman of the Ibrahim Prize Committee and sits together with an eminent panel of judges composed of previous winner Festus Mogae, Aicha Bah Diallo, Mohammed El Baradei, Graca Machel, Martti Ahtisaari, and Mary Robinson. “His ability to command the confidence and the trust of his people is exemplary. During the decade of his presidential mandate, he demonstrated sound and wise leadership. At the same time he maintained his humility throughout his presidency,” Salim noted on President Pohamba’s tenure. While Namibia does not rank as high as Africa’s big hitters, Nigeria, South Africa, Ethiopia, Algeria, Egypt, Cameroon, Morocco, Ghana, Zimbabwe, Sudan, Kenya and Zambia the southern African nation has established itself as a paragon when it comes to the rule of law. Though large in size covering some 825,418 square kilometres Namibia’s population currently stands at 2.2 million people. A veteran of Namibia’s liberation struggle and successor of Namibia’s liberation hero and founding leader Sam Nujoma, President Pohamba was first elected in 2004 and carried forward the mantra of the liberation movement the South West African People’s Organisation (SWAPO). This was 14 years after SWAPO won independence from South Africa. In his early years, Pohamba was viewed as weak and more so a “Nujoma stooge”, but after he convincingly won the 2009 elections this criticism could no longer hold. SWAPO which transformed itself from a liberation struggle movement into a political party still dominates Namibian politics. Pohamba’s successor Dr Geingob is another SWAPO veteran who previously served as Namibia’s prime minister. President-elect Geingob won the November 2014 presidential polls which now serve as Africa’s historic milestone by becoming the continent’s first electronic ballot. The smooth handover of power in Namibia’s politics has enhanced SWAPO’s profile. Five main standpoints define the award’s criteria. One must be a former African head of state or government, who was democratically elected and served their constitutionally mandated term. They must also have demonstrated exceptional leadership during their tenure and left office in the last three years. It is clear the award is aimed at motivating constitutionalism, robust and people-centred leadership with mentorship ideals and dissuading political intrigues which breed intolerance, economic stagnation and dissent in the continent. Other than the prestige associated with the prize, the laureate is feted with a cash award of some $5 million spread over 10 years and a further boost of an annual $200,000 for life making it the largest in the world. By joining the coveted list of Ibrahim laureates President Pohamba walks into the sunset with these perks and his public interest activities and causes are likely to be considered for a further grant of $200,000 per year for a decade. The Ibrahim Prize for Achievement in African Leadership is named after the British-Sudanese telecom billionaire Mo Ibrahim. The award which is ideally promised to be awarded annually has apparently been bestowed only thrice since 2007 and now for the fourth time with Pohamba's win. Former Mozambican President Joaquim Chissano was the first winner in 2007. Chissano received the inaugural prize for getting Mozambique out of a fractious civil war, “bringing peace, reconciliation, stable democracy and economic progress”. In the following year, Botswana’s Festus Mogae, became the second recipient for stabilising Botswana and prospering it even in the face of a debilitating sweep by HIV/AIDS. There was no winner in 2009 and 2010. The prize committee did not select a winner in 2012 and 2013. South Africa’s first democratically elected President Nelson Mandela is also an honorary laureate of the Ibrahim Prize for Achievement in African Leadership, a recognition he received in 2007. Looking at the 2014 Ibrahim Index of African Governance, the pattern explaining why President Pohamba won is easy to decipher. Mauritius, Cape Verde, Botswana, South Africa and Seychelles take the first five slots with Namibia occupying the sixth position. Except for Mozambique’s President Chissano, all the Ibrahim laureates have had their countries in the top 10 list of the Ibrahim Index of African Governance.